LOS ANGELES  Biologist Gerry Kuzyk was hiking with his wife in the remote reaches of the Yukon when he caught the scent of caribou dung wafting through the chill air. Then he saw it  the biggest pile of animal droppings he had ever seen, 2½ meters high and stretching over a kilometer of mountainside. Kuzyk, a researcher with the Yukon Department of Renewable Resources, knew there weren't enough caribou in the entire territory to create such an epic mound. Odder yet, there hadn't been caribou in the area in nearly a century. "It was like being in the 'Twilight Zone,'" said Rick Farnell, a colleague who helped investigate the find. "You could see them from a distance  big, black bands of feces. I'm talking tons of it." The mystery was solved by lab analysis: The dung, the product of innumerable migrating caribou herds, had been frozen for thousands of years and only recently exposed by melting ice. Along with the dung, the scientists soon discovered an arsenal of Stone Age darts, arrows and spears. For most scientists, the warming of the planet is a disturbing trend that could radically alter the environment. But for archaeologists, it has prompted a breathtaking treasure hunt. Without doing any digging, scientists are scooping up artifacts, mummies and fossils long hidden in the depths of monstrous glaciers. "We walk right up and pull arrows and animals out of the ice," Farnell said. Many of the items are simply the random debris of 10,000 years of passing human and animal traffic. But the glaciers also have coughed up some stunning finds. In 1991, Swiss hikers in the Alps found "Otzi," a 5,300-year-old "ice man" felled by a flint-tipped arrow. 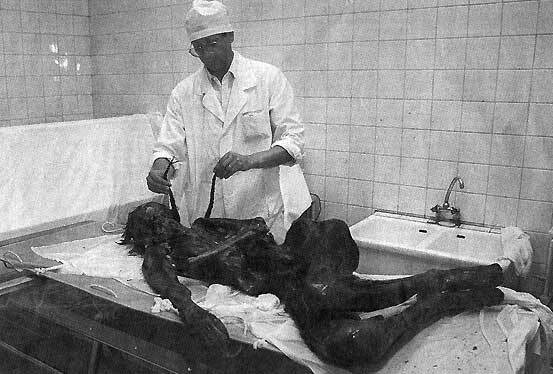 A second ice man with a perfectly preserved woven hat and gopher-skin cloak melted out of the ice in British Columbia in 1999. "It's incredible what's in the ice," said E. James Dixon, an archaeologist at the University of Colorado's Institute of Arctic and Alpine Research. Piece by piece, the artifacts rising from the ancient ice are beginning to recast archaeologists' understanding of the thousands of years after the last great Ice Age, an epoch when animals began probing the northern fringes of the planet and bands of humans began to populate North America in large numbers. "There's a whole new scientific window opening," said Dixon, an expert on the human colonization of North America. Unlike buried dinosaur fossils or crumbling Mayan monuments, the glacier artifacts are relatively unchanged from the day they were first encased in their icy tombs. Arctic lupine seeds frozen for 10,000 years, for example, grew into healthy plants once they were removed from Ice Age lemming burrows. The ice holds a zoo of perfectly mummified animals: fish, wapiti, sheep, mountain goats, moose, voles and birds. "They're so beautifully preserved, they look like they're asleep," Farnell said. "You can't tell whether they died last week or died 4,000 years ago." For archaeologists used to piecing together the past from chips of flint, finding soft organic material is a rare bounty. They have flesh filled with DNA, feathers and dustings of ancient pollen. There are stomachs filled with the remnants of a last meal, and human skin sporting patchworks of tattoos. The part of glaciers now melting captured a very particular slice of history  a roughly 10,000-year period from the end of the last great Ice Age to the present. The period began when the forbidding sheets of ice that had covered much of the Northern Hemisphere were beginning to retreat, opening a new realm of the planet to animals, birds and waves of human wanderers who eventually found their way to the Americas. Over the ensuing years, the glaciers ebbed and flowed, driven by vast, cyclical changes in weather that could send tongues of ice rushing downward, only to retreat a few hundred years later. The last one, known as the Little Ice Age, began around 1450 and completed its cycle around 1900. The planet is now in the midst of a natural warming cycle that has been compounded by the modern infusion of greenhouse gases. The result is a galloping recession of ice that has not just sprinkled these treasures of history on the landscape, but spewed them, heaping era after era into one big pile. Lying next to 6,800-year-old stone points are 3,500-year-old dart hurlers and 2-meter spears. Recently dead animals lie next to 3,000-year-old carcasses. One of the best-known discoveries is the frozen mummy found in the Alps in 1991. Named Otzi after Italy's Otztal Alps, the ice man was found by two hikers who spotted the corpse embedded in the melting Schnalstal glacier. Otzi had straw shoes, a leather coat with goat fur, a copper ax, a stone dagger and a bow. He was so well preserved that scientists were able to determine his last meal (some bread made of einkorn wheat and meat) and conclude that he journeyed into the mountains between March and June (the pollen in his stomach comes from a tree that blooms then.) The presence of Otzi and other human artifacts has surprised scientists such as Dixon, who had no idea that so much human activity took place on these forbidding fields of ice. In 1999, a trio of sheep hunters at the edge of a glacier in northwestern British Columbia found a piece of wood on the ground, an unusual sight in that barren area above the tree line. It turned out to be part of a carved walking stick. Further exploration turned up the corpse of the unfortunate "Kwaday Dan Sinchi," or "Long-ago Person Found." Radiocarbon dating showed the man had lived in the 1400s, and was in his 20s. Found with the body were a carefully woven waterproof hat, a gopher-skin cloak and a leather pouch filled with snacks of plants and fish. Tools found near Kwaday Dan Sinchi were made from both coastal and interior trees. The gopher cloak came from the interior, while the hat, made of cedar and spruce roots, was in the coastal style. Modern tribal weavers had never seen the hat pattern before but are now re-creating it to preserve history and reuse its excellent design, Strand said. It's only one of the many tantalizing bits of information that have begun to emerge from the disappearing ice. The warming is expected to continue and perhaps accelerate, removing the frozen protection that has kept artifacts and bodies in such good condition. Without its blanket of ice, organic material decays and disappears. Dixon and geologist William Manley of the Institute of Arctic and Alpine Research developed a computerized mapping system to help them locate the most promising areas for collecting. Manley, an expert in past climates, layered a series of maps together, looking for areas where glacial melting coincided with good hunting grounds, mineral licks or rock-collecting sites that may have drawn ancient people. "Rather than rely on serendipitous discovery, we wanted to hone in on the most productive areas," Manley said.